The most common question an automotive journalist will be asked is "What car should I buy?" This is a loaded question, since our vehicles are not only an extension of ourselves, but also should fit exactly what our lifestyles and transportation requirements are. Sure, owning a Bugatti might be awesome, but how many of us can actually afford one – let alone maintain it? So when Patrick approached me about writing what I would purchase if my family were shopping for a new car right now, breaking choices into three criteria, I was happy to oblige. Although I haven't driven every 2013 model available (yet), I've driven enough of them plus the basically unchanged 2012 models to make my choices clear. These choices are based on where I live, what my family of five (two toddlers, two adults, one Labrador) needs in a vehicle, and my preference for cars that are a value for the dollar. I also tend to do most of my own maintenance, so I prefer vehicles that are accessible in that regard. This is the car that will be the primary people mover for our family. We currently have a 2006 Mazda5 minivan for this, but while the 2013 model is nicely done, these aren't exactly fun road cars. I'm glad we have it, but I would prefer a large sedan for the fun factor and better efficiency. The 2012 Passat TDI was one of the most fun-to-drive, cost-efficient, and roomy midsized sedans I've driven. 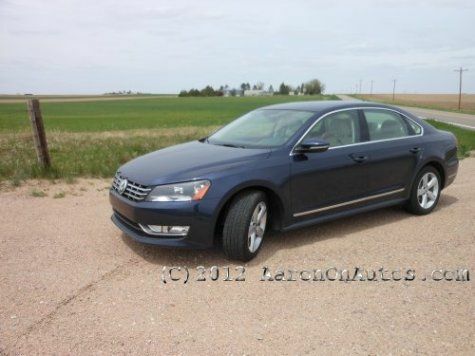 It has all of the Volkswagen "fun factor" in driving, is extremely responsive, sat all of us comfortably, has a roomy trunk, and gets 43 mpg or better on the highway. The 2013 model sees a few detail changes for the interior and infotainment system, but otherwise remains largely the same. Yes, the Fender Audio System is well worth extra upgrade.. even if all you get to use it for most of the time is to listen to The Wheels on the Bus and I'm a Little Teapot. For the record, I'm with Jim Brewer on the whole "AC/DC should do a children's album" thing. Although some of the competition, like the Camry Hybrid, are close seconds, nothing beat the Passat TDI for me overall. Living in rural Wyoming, most of the vehicles people think of as "efficient" aren't really a great choice – between directions that include "leave the paved road.." and a lot of highway driving at high speeds (75 mph on the freeway and no one here knows what "traffic" truly means), cars like the Volt and the Leaf aren't good choices. Economics say that the efficient car chosen should be capable of handling the wind, gravel, and occasional icy road. It should also have no problem toting at least four of us at once, but would primarily be used for just one or two. Currently, an aging Honda Civic fills this role for us. As much as I'd hate to replace that Civic – and honestly, unless it's truly dead, I would keep it - the current-generation is just not quite what we'd need anymore. Instead, I would choose a Toyota Prius c. Of all the test cars I had as test drivers this year, I think I had more fun in the Habanero Orange Prius c than I did in any other. The low-slung batteries, compact size, roomy interior (even for someone of my stature at 6'3"), and unique style of this little car make it great. We held 47 mpg with two adults and two children in the car on a short day trip and thanks to the four doors, getting everyone in and out was not a problem. Had the car been slightly larger in terms of cargo space, it would have made my choice for daily driver. It's that fun. Even with the fully-outfitted 2013 Prius c 4 package, the car is only about $25,000. As a friend remarked when I showed him the price tag on the test vehicle I had this summer: "Hell, I could sell beer cans for that payment." This is a fun category, which could include a lot of things. For some, "utility" merely means the ability to put a lot of people into the vehicle. For others, it might mean the ability to tow a lot of weight. For me, it means pickup truck. After all, I live in Wyoming and volunteer hauling hay for a local large animal rescue. Not to mention the nearest home improvement store is 90 miles in round trip. For the mixture of freeway and heavy hauling that happens around these parts – plus the extra capabilities that might be needed, like snow plowing or pulling stuck vehicles out – a pickup truck is where it's at. In my experience, nothing beats a Ram Truck for comfort and capability in one package. There's nothing wrong with Ford, GM, etc., but he coil springs under the bed (instead of leafs) gives Ram the edge in highway driving and rider comfort, I think. I recently sold my 1990 Toyota SR5 4x4 and am very unhappy to be without truck at present. At the same time, I would prefer to upgrade to a heavier truck than that for trailering. Currently, I use a borrowed 1990s Kenworth W9 for hay and manure hauling, but maneuvering a full-on tractor-trailer is not fun and it's extreme overkill for the amount of weight being moved. I greatly enjoyed the game-changing 2013 Ram 1500 V6 during my short test drive at the Rocky Mountain Automotive Press' 4XFall event last September. I would prefer, however, the cost-efficiency and lower emissions of natural gas. This is only available off the line from two pickup manufacturers right now, General Motors and Ram Truck (Ford's is an after-factory addition). To get CNG, you have to go with a 3/4 ton, such as the Ram 2500 CNG. I have access to CNG for fueling (at less than half the cost of diesel fuel at present) and the Ram 2500 CNG is more than capable plus has the added advantage of being dual-fuel so if I travel where I can't easily get CNG, it can be fueled with gasoline. Even in its base model, the 2500 is a great working truck that is well-outfitted. The $1,500 addition of the air ride shocks and self-leveling is a must, though, as it adds little touches like the ability to lower the truck to make it easier to get in and out and load/unload. The integrated load locks on the premium bed liner are another must-have. In my time in various versions of the Ram, I've found them to be capable, hard-working, and dependable trucks. For a while, Chrysler-Dodge lost that focus and made some questionable pickups, but that's changed in the past few years and the Ram Truck brand is working hard to establish itself again. Their segment-jolting 2013 re-design from the ground up proves that they're back in the game. My choices may not be your choices. That's how things are. Some people live in the city, live where CNG isn't available, aren't interested in "tin box cars", etc. Maybe you will only buy "American" (whatever that means), prefer a lot of body roll instead of tight handling, or are very brand loyal. The great thing is, the market is huge and there are a lot of vehicles competing for your dollars. The variety is endless and while one segment might tend to have a lot of look-a-like vehicles in it (think compact sedans), overall the beauty of our open market is that choices abound. What are yours? TDI, sure. Why? Cause the American OME's are to afraid of the EPA and CARB and the great job of getting Americans into diesel that GM did in the 70"s. Why did Ford drop the Ranger in the states and still offer it around the world with diesel power? If they offered it with 35 40 MPG it would sweep the fleets. Toyota, NO. Why? Cause it bothers me to send $6000.00 to Japan every time someone buys one plus the gain in MPG is not worth the overall cost of ownership. The Dodge Ram? No I think your last observation still holds, it going to take a lot more then CNG to bring them onto the playing field. Now could Ford be doing better, you bet. Ford get your head out of the sand and start finding and offering the American truck buyer a real choice of power trains like the Ranger with a 2.5L TDI and a fitting 6L TDI for the 150 and 250 along with CNG.